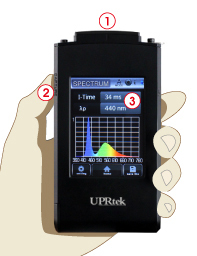 The UPRtek MK350N Spectrometer is the first truly compact, lightweight illuminance spectroradiometer which can be used without a computer for evaluation of next- generation lamps such as LED, OLED and EL illumination, as well as, conventional architectural and stage/ studio lighting, even lab research applications. The time spent for fluent processes started from booting to zeroing calibration, to data capturing to diagrams form-up to data storage is just within a few seconds! Since the environment vary from minute to minute. To ensure the measurement accuracy, Be sure to do zero calibration before measurement. Copyright © 2015 Strider Instruments All rights reserved.